A late morning shooting in Elk Grove involving a police officer where the suspect sustained minor injuries in under investigation by the Sacramento County Sheriffs Department. According to information from the Sacramento County Sheriff's Department, at approximately 11:07 am. on Thursday, January 17, two Elk Grove Police officers contacted a suspect described as a Caucasian male, 25, from Sacramento on the 8000 block of Orchard Loop Lane, which is just yards out of Elk Grove city limits. Officers told police and sheriff's investigators they saw an object in the possession of the suspect that resembled a firearm. After exiting their vehicle, the officers contacted the suspect, he quickly moved his hand from his waist area and quickly turned to the officers. The officer closest to the suspect fired a round. Upon investigation, the item in the suspect's possession, which was dropped after the shooting, was a large (approximately 10”), dark-colored grill utility lighter. The lighter had a trigger mechanism and long wand (black in color), which was consistent in appearance to the barrel of a revolver. 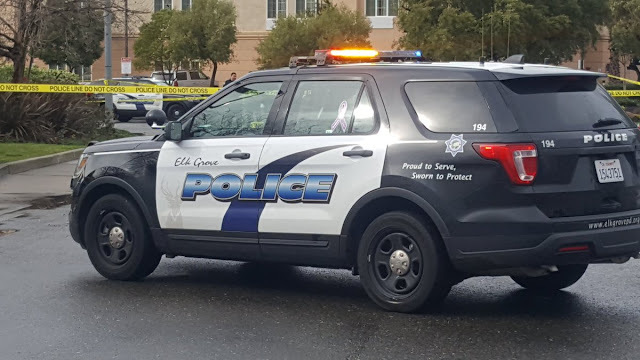 Sheriff’s Department Homicide Detectives, Crime Scene Investigators, and Elk Grove Police Department Internal Affairs Investigators responded to the scene to begin the officer-involved shooting investigation. Since the shooting happened outside of Elk Grove, the investigation will be done by the sheriff's department. The officer involved in the shooting is a 19-year veteran of law enforcement and has been with the Elk Grove Police Department since 2006. In accordance with Elk Grove Police Department policies and procedures, the officer involved in the shooting will be placed on administrative leave.